Folklore tells of a tribe of supernatural sea creatures called the Blue Men of the Minch, known in Scottish Gaelic as Na Fir Ghorma, who used to inhabit the stretch of water known as the Minch, between Lewis, the Shiant Islands and Long Island. In legend, they were among the children and descendants of Beira along with the Nimble Men, or Merry Dancers (Aurora Borealis), and the Green Ladies. 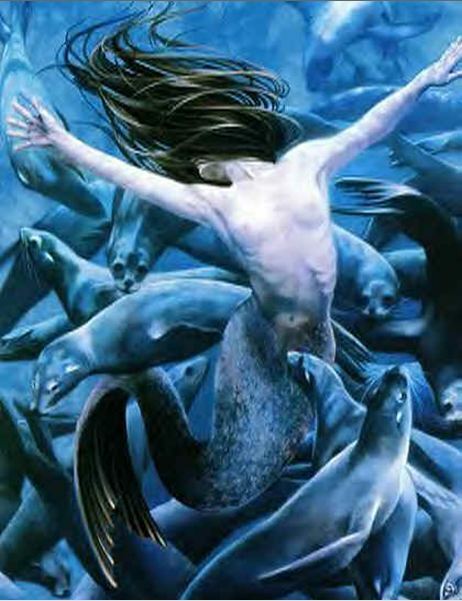 They were humanoid in appearance with blue skin, kinned with mermen they would swim alongside ships passing the Sound of Shiant in an attempt to lure sailors into the water, and conjure storms to wreck ships. They lived in deep underwater caves in a clan system ruled over by a chief. When the Minch was stormy the Blue Men of the Minch would appear. They would swim up from their caves at the bottom of the sea near the top of Lewis and grab hold of the keels and oars of passing ships. Their chief would rise up out of the water and shout two lines at the occupants of the ship. If the captain could not come back with a suitable rhyming couplet the Blue Men would pull the ship to the bottom. One day a massive ship came into the Minch and the Blue Men gathered. The ship was so big and powerful they could not stop her. The chief of the Blue Men rose from the sea and cried to the captain of the ship. ”Man of the Black Cap, what do you say, as your proud ship cleaves the trine?” The captain replied ‘My speedy ship takes the shorted line, And I’ll follow you line by line. ”The Chief went on, ’My men are eager, my men are ready, To drag you below the waves” to which the reply came’ My ship is speedy, my ship is steady. If it sank it would wreck your caves.’ The chief of the Blue Men realized he was well beaten and sank below the waves allowing the ship to continue on its journey. There are a few theories about their origins, it has been suggested that they were fallen angels, and on a more historical note, a folk memory of Moorish slaves marooned in Ireland in the 9th Century by Viking pirates and slave traders. Where the Blue Men are splashing round the charmèd isles. And the flashing of their fingers in the Blue Men's Stream. Oh, they'll bellow o'er the billows and wail upon the wind. Or crack the keel between them, or stave it with their fists. Oh, weary on the Blue Men, their anger and their wiles! When billows toss, Oh, who would cross the Blue Men's Stream!